It feels like I live in a hotel! A truly impressive spot to live, friendly staff, beautiful people. From gym classes to private cinema showings, a party room, snooker table, pool, sauna, team, outdoor jacuzzi and valet parking. There’s not much else you really need on your doorstep. I can walk along the river to Battersea park or Vauxhall. I live on top of an enormous Waitrose, there is a market downstairs every Saturday and an insane breakfast spot called District. I dislike the noise of the road and that I can see there will be a building that will go up in front of me and partially block my view of the river. It gets very hot in my flat and the comfort cooling takes a long time to kick in. I went to visit a friend who lives there and the pool, gym and cinema are amazing. The flat was also beautiful with great views of the river. The cinema has lots of comfy sofas and a big selection of films to watch…it was the perfect Sunday evening. We chose to live here because of the location but also the facilities that Embassy Gardens has to offer. There is a pool, gym and sauna – we don’t find them crowded or hard to access (gym can often be empty if you find the right time!) and they are beautiful, love the ground floor pool looking out onto gardens! We use the Lounge quite often – for a bit more space outside of our apartment when meeting friends or sometimes if there is an international match on tv or watching the winter olympics, it feels like being back at college in the dorm but more grown up! They are great about putting on socials and events – we went to the social at the embassy recently and it was great to see this incredible building and meet some neighbours in a new setting up close. The architecture and design is so well thought out – small details like the lifts are pretty! Balconies are designed to share light – so lovely in the summer and protected in the winter. 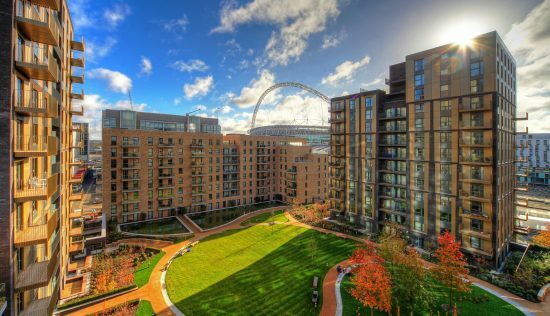 It is all the amenities that also made this development stand out for us – whilst we don’t use them all (gym!) – it is wonderful to make use of the communal places and invite friends over to pretend you are having a spa day! Excited about the skypool..! We initially felt a bit shy about hanging out in the communal areas, I don’t know why but when you aren’t used to living in a development it can feel a little strange. Once we did we actually met lots of neighbours and have formed friendships – I have a friend who I regularly swim with and my partner often times his commute with a guy he met in the gym – so I wish I had known to embrace things earlier. Eg have sorted out the lifestyle and are building a community – something other developments appear to be lacking. I used to live in a building with five flats and never knew my neighbours or those on my street but the communal areas and events here bring everyone together. 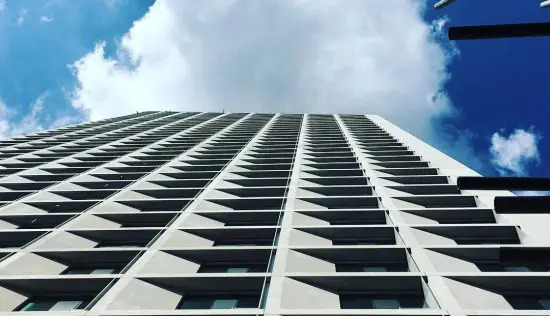 It wasn’t active when I moved in but they have a great instagram account @embassygardens which share events and stories behind the building as well as the lives of tenants. Great to follow if you want to be part of the community rather than just live there. I love living here, it is a great location and building with brilliant facilities. I am so excited to see what the sky pool looks like and other planned things such as the garden walk but they are not due for completion until next year. The cinema is the best secret on earth and plays lots of classic old movies – cosy and personal and a great way to make friends with neighbours. Nine Elms on the South Bank is a name that is going to be cropping up with increasing frequency when it comes to new property. In particular, the Embassy Gardens development is a much buzzed about complex, mostly owing to That Pool. Which we will come to later. 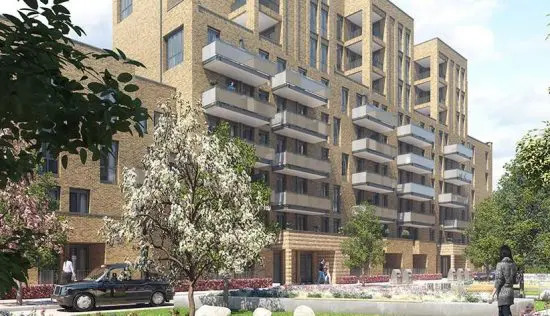 Phase 2 of the development, the Legacy Buildings, are a collection of 25 one and two-bedroom apartments offering luxe living in the heart of Nine Elms. Although there are a number of garden apartments starting from £650,000, the majority of homes in this phase will be over £1million. 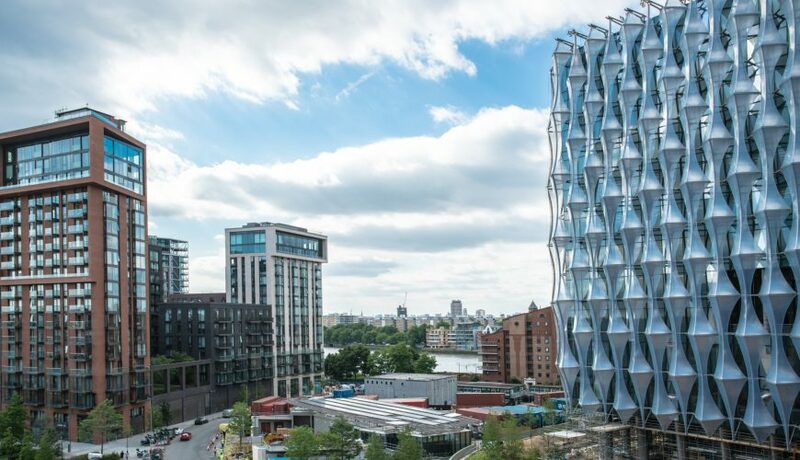 Centred on the new US Embassy, located on the strip of riverfront between Vauxhall and Battersea Power Station and by the New Covent Garden Market, this neighbourhood is all about the regeneration. And it has been a long time coming. The masterminds behind this project are Ballymore, supported by HAL Architects, Sir Terry Farrell CBE (the man behind the Home Office HQ and MI6 building, among others), Spanish interior designer Luis Bustamante, London based interiors firm Benningen Lloyd, and finally Huw Morgan in charge of landscaping. 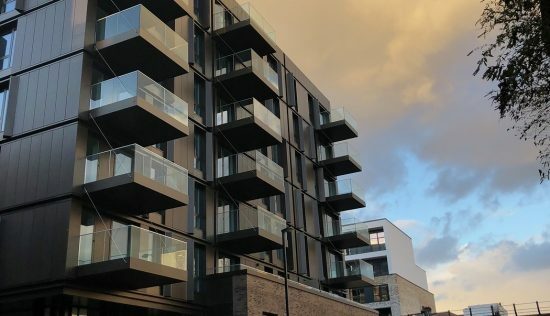 Embassy Gardens takes an enviable spot across the Thames from Chelsea and Kensington, with Westminster, the Southbank Centre and London Bridge just a short walk away. Vauxhall station, of course, isn’t going anywhere, with its fast connections beyond the capital. 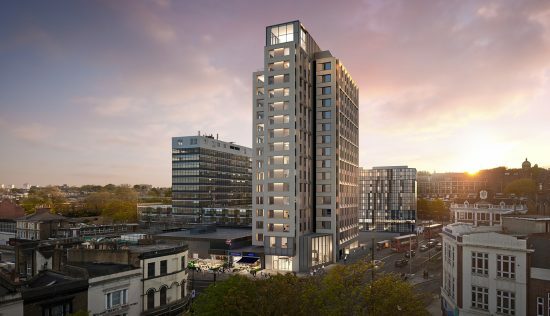 And two new tube stations, Nine Elms and Battersea,, plus a proposed Nine Elms footbridge and a new Thames Clipper station add up to a sought-after address, and investors are sitting up and taking notice. Families and young professionals will be drawn to its many facilities, including its own green space, shops, a Waitrose supermarket, restaurants, independent cafes and even an art trail. Residents can take a break from hectic city life at the Legacy gym, steam and sauna rooms, and yes, at the pool. The 25 metre Sky Pool is a world first, a crystal clear acrylic pool suspended between two buildings at 10 storeys. Impressive? Most definitely. Practical? Well, the fact that our climate is often more Baltic than Californian means it’ll have a limited window of use, but there’s always the indoor pool that can used the remainder of the year. Whether it becomes an elevated algaed duck pond will remain to be seen. Meanwhile, the Eg:le Cub is a members only sanctuary, giving guests exclusive access to the Sky Deck and Pool, the Orangery rooftop bar, private cinema, gym and yoga studio among other first-class amenities. With the presence of the US Embassy brings increased need for security, so 24-hour security services and a CCTV system that covers the whole estate have been put in place. Car owners aren’t favoured, with limited spaces available and at extra cost. As for the housing itself, it takes inspiration from Soho loft living, with floor-to-ceiling glass windows letting in an abundance of light. Handcrafted touches pepper the apartments, with natural materials such as oak, marble and black granite woven into the decor. The interiors by Benningen Lloyd in particular give the homes a sense of fun and whimsy, the opposite end of the spectrum to the new development grey box. But not clawingly so. Concealed LED lighting, built-in wine cooler, bespoke metal door pulls understated but essential touches throughout. Since the average price per square foot in SW8 is just over £1,600, Embassy Gardens sits below that at around £1,100. And with the location and facilities on offer, it represents a decent investment. If buyers were looking for something yet more elaborate, they might want to consider AYKON London One, a vision in Versace.